Wow this has been such a great experience I will definitely be doing another challenge like this again, I am learning so much. 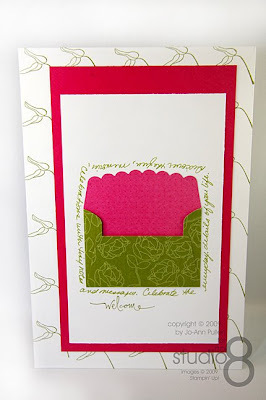 I hope you liked the matchbook style booklet that I created yesterday it was so easy to do. For today’s challenge, I used the big shot for these two pages, and even better I used vellum and made a pocket sleeve that will go between the two pages. If you are new to this you can read about my personal challenge here and view what I have done so far for Day’s 1, 2, 3 and 4 of the challenge. Take Old Olive 5 w x 5 h and using the Top Notes die and your big shot cut out one. 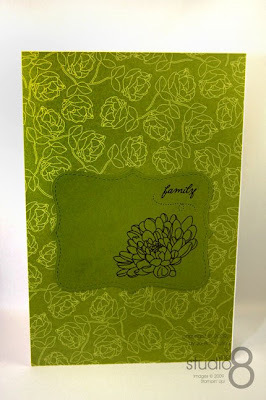 Attach the DSP Lovely Flowers 6 w x 9 (green flowers) to the Whisper White (all pages) 6 w x 9 h.
Take the Vellum card stock 11 w x 8.5 h and score at 5.5 so that it is half the size then score at 8 inches and folded. Using adhesive secure the bottom, basically you will have two sides open, the top so you can slip your treasures in and the left for when you are binding it. 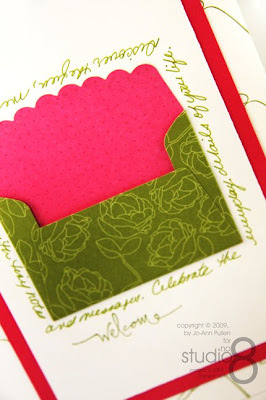 Misc: Big Shot Die-Cut Machine, Stampin’ up Scallop Envelope, Old Olive Stampin’ Write marker. 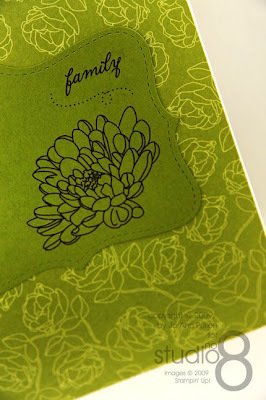 Take DSP Lovely Flowers 5 w x 5 h (green flowers) and using the Stampin’ up Scallop Envelope die and your big shot cut out one. Score and make envelope. 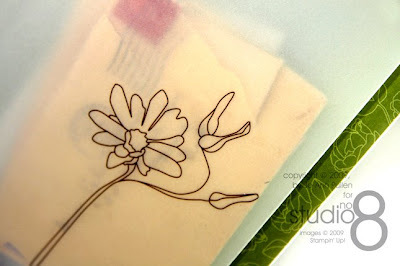 Using the leaf stamp from the Flower Lines Stamp Set and Old Olive Classic Ink stamp a pattern onto Whisper White (all pages) 6 w x 9 h.
Take the Scallop Envelope that you punched using DSP Lovely Flowers and add to the front of the Whisper White 4.25 w x 7 h.
Using one of the stamps from the Warm Words Stamp set and Old Olive Classic Ink stamp below the Scallop Envelope ensuring you allow enough room to write a message. 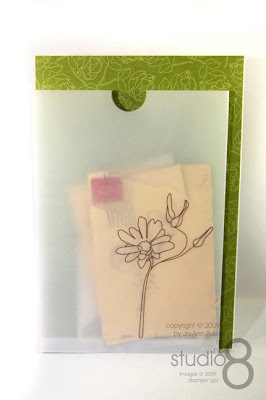 Using the Old Olive Stampin’ Write marker, write in your own handwriting a message or poem.